My loving parents were nice enough to buy me a MAIO print -- one that I'd remembered seeing years and years ago at an antique store, and I couldn't believe it was still there. It looks even better than my uncle's, because the green and yellow tones go with the den (it's hanging over my desk as I type this!) but it's a different one than Larry's. I always wondered if the one that my uncle had was a MAIO or just one of a similar style. That's definitely a MAIO -- they have a photo of the signature in the eBay listing. And the buildings are absolutely identical to the painting my uncle had... if you start counting them from the right. But this painting on eBay right now is wider than my uncle's! 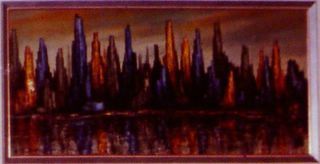 The buildings in his just stop as you move from right to left, and the ones in the official MAIO print keep going and taper down on the left side. It also looks like there's less sky above the tallest skyscraper. Remember that I didn't crop the photo; what you're looking at in the top picture from Larry's living room in the 1960s includes the picture frame. What's the deal? Did someone trim down Larry's painting so it fit better over the couch? Were there a series of differently-sized MAIO prints of the same original painting? Weird! The New York Times says it prints all the news that's fit to print, whereas other papers print "all that fits." Perhaps that was the case with Larry's painting: frame all the print that fits.